I do not like to clean. I'm not a naturally clean person, so it's especially hard for me sometimes. I was raised by a mother who kept a spotless house, even though she worked 50+ hours a week. I'm a stay at home mom and it's hard. It also doesn't help that I get distracted easily. I really need structure when it comes to cleaning. And, I just am not the kind of person that "cleans as I go". I wish I was. In the past few years, I've developed a system that works for me. I call it the "15 Minute Clean-Up"
Basically, I give myself exactly 15 minutes to clean each room. Simple. Easy. Just the way I like it. Today, I'm going to show you my method of the daily cleaning to my kitchen. Once a month, I will deep clean the kitchen - if you keep up with the daily cleaning, once a month deep cleaning is really all that's needed. This is the mess left over from breakfast, making sack lunches and the few dinner dishes that wouldn't fit in the dishwasher. #1 - I take a plastic grocery sack and walk around picking up all the trash I see. Set the bag in the corner out of the way when you're done. #2 - Get all the paper clutter out of the way. This counter top is where the mail gets put down. Throw away all junk mail and quickly put any bills in your bill collector. 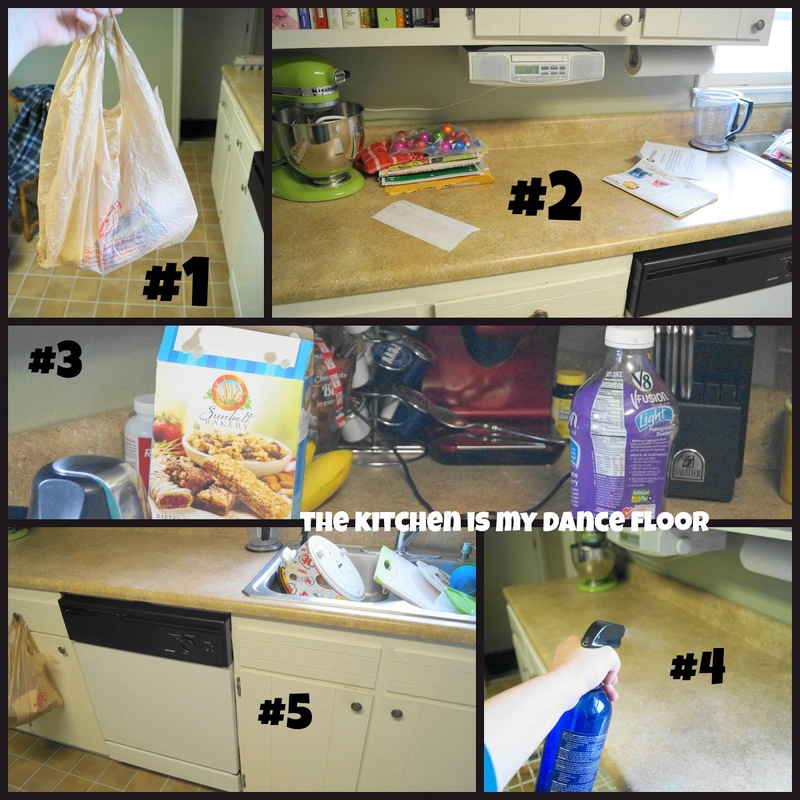 #3 - Put all food items away. Any small appliances that don't belong on the counter top also need to be put away. #4 You should have clear counter tops now. Get your cleaner out and spray them down. Don't wipe yet. #5 - Empty the dishwasher and put the dirty dishes back in. Once your done with the dishwasher, then give all the counter tops a good wipe clean. 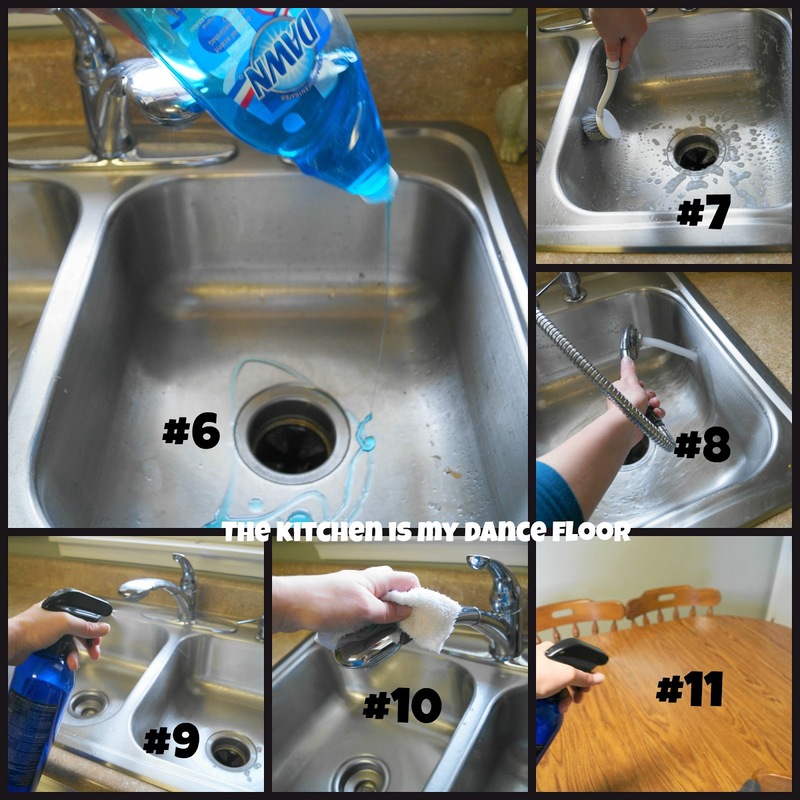 #6 - I love a clean sink. Squirt some dish soap in the sink. #7 - I keep a brush under the sink to give the sink a quick scrub. #9 - Spray around your sink with cleaner. #10 - Take your same rag and wipe the sink down. Make sure and get anything that might have gotten behind the faucet. #11 - You're done! Spray off the kitchen table and wipe it off. Make sure your chairs are pushed in. I only sweep once a week or as needed and I either mop once a week or use my rag to spot mop throughout the week. Cleaning my house this way saves my sanity! I use 15 minute clean-ups for every room in my house. On the weekends when everyone is home - we will do a whole house 15 minute clean-up. Everyone knows their areas to clean. This is so very important to help keep our house from not looking like a tornado hit is by Sunday afternoon. 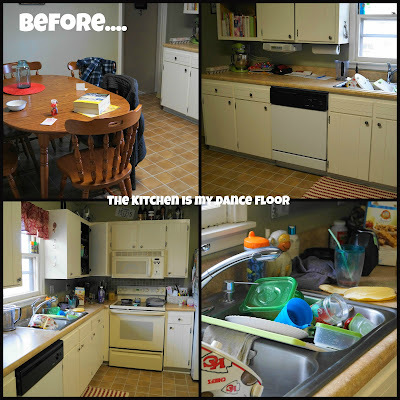 I will say that my kitchen is small compared to others, so your kitchen might need a 20 or 30 minute clean up each day - find a time frame that works best for you. What methods do you use to clean that help save you time and energy?